On Thursday, January 19, the Community Center for the Performing Arts proudly welcomes The Keller Williams KWahtro to the WOW Hall along with special guests The Kitchen Dwellers. 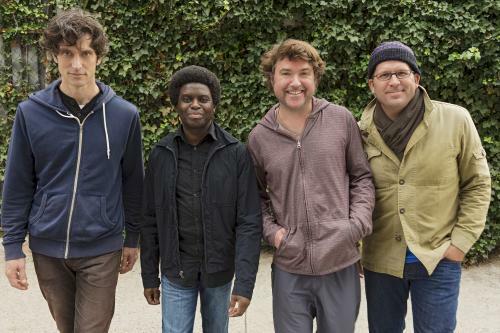 Keller Williams’ four-piece project called KWahtro is touring in support of Keller's newest album over a three night run in the Pacific Northwest. Sync, the first studio album from KWahtro, will be released on January 20. KWahtro performs what can be referred to as “acoustic dance music.” With songs primarily written by Williams, the music infuses reggae, folk, jazz, Afrobeat and dance rhythms into new and innovative arrangements. The improvisational nature of the performances allows freedom as well as precision by musicians who have formed a symbiotic relationship. Like the album title, KWahtro are four musical spirits fully in sync, creating a sound that is something unto itself. This is a rare opportunity for Williams’ fans, as KWahtro will perform only a handful of special dates in the Northwest in January. Williams will spend most of January through April touring with one of his heroes, acoustic legend Leo Kottke. Their celebrated Shut The Folk Up & Listen tour will pick up on January 12 in Ridgefield, CT. Williams will also be performing solo dates. As if one release wasn’t enough, on January 20, Williams will also release Raw, a 10-song collection of solo acoustic material. These straightforward performances are not enhanced by the masterful looping Williams has become known for during his solo performances. Raw showcases the artist and his instrument, hence the aptly titled album. To coincide with the release of Sync and Raw, Williams has joined forces with the Summer Camp Music Festival for the “Go to Summer Camp with Keller” contest. The prize includes an all expenses paid trip to Summer Camp Music Festival (flights for two & rental car) as well as two VIP Weekend passes to the festival, backstage access during Keller’s set and two pairs of Keen shoes. To enter, fans can purchase Sync or Raw(CD, Digital Download, or Vinyl) through www.kellerwilliams.net before 1/20/2017 and receive two entries into the contest. Purchase Sync or Raw between 1/20/2017 and 3/5/2017 and receive a single entry. Visit www.kellerwilliams.net for more info and official rules! Kitchen Dwellers formed three years ago below the Bridger Mountains with the sizzle of afternoon breakfast and the warmth of Irish coffee brewing in the kitchen. What began as a trio -- Shawn Swain, Joe Funk and Kyle Shelstad -- began writing music and playing traditionals while searching for originality and, occasionally, other life forms. Torrin Daniels was quickly added on banjo and the band began playing shows around Bozeman, Montana. They added Jesse Bulter on fiddle just in time to hit the road for Colorado and complete their sound. The Kitchen Dwellers have shared the stage with high profile artists like Railroad Earth, Greensky Bluegrass, the Deadly Gentlemen, Head for the Hills, Town Mountain, Pete Kartsounes, and WhiteWater Ramble. The band has played many high profile venues in the west such as The Bluebird Theater, The Mishawaka Amphitheater, The Oriental Theater, and The Emerson Theater. Kitchen Dwellers have been accepted into three Telluride Bluegrass Band competitions, and were voted as one of the top three bluegrass bands in the country by viewers through a video contest hosted by Ninkasi Brewing Co. and Northwest String Summit in Eugene, Oregon. In the winter of 2013 they won the Zoo Music Awards, a Montana Music Competition based on performance, originality and popularity. They also were awarded "Best Local Band 2013" by the Magpie Awards. Tickets are $17 in advance, $20 at the door. Doors open at 8:00 pm and showtime is 9:00.